Come show your support for your favorite presidential candidate NOW! You don’t need to wait until May 10 to show your allegiance for the candidate at the hush-hush ballot booth – holler your support by wearing the candidate T-shirt printed in their highly distinctive campaign color and logo! If you do not have a HighStreet5 account yet, you can create one HERE! 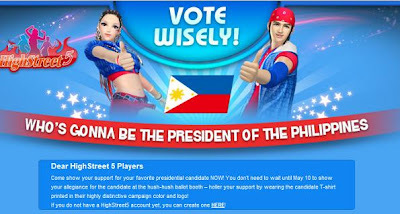 To participate in this virtual presidential election, you only need to purchase a 30-day presidential candidate T-shirt of the presidentiable that you would vote for to show your support for him/ her. When the election ends, players who supported the winning candidate by way of purchasing his/her candidate’s T-shirts will be amply rewarded! Yes, ALL players who supported the new president will each be getting [Gift] Candy*2+Diamond Treasure Box*5 by May 20! We won’t keep you waiting for long before we stage in-game events where you would be joining other campaigners in your camp (Show your unity in the same candidate T-shirts!) to battle against one another and score for your favorite candidate even before the ballot gets rolling! Keep your eye out at the official website for details of upcoming events!